Jeffrey Welch's Blog: Let’s Talk Apple Cider Vinegar for Dogs — Can You and Should You Use It on Your Pooch? Although it has been used as part of natural healing for centuries – even as early as 5,000 BC when the ancient Greeks prescribed it to treat colds! — in recent years, apple cider vinegar has been touted as a bit of a cure-all. A quick Google search will show claims that taking it is an effective treatment for everything from acne to weight loss; from controlling diabetes to curing hiccups! Apple cider vinegar is popular as a natural treatment for humans — so what about apple cider vinegar for dogs? Is apple cider vinegar safe for dogs? And if you can use apple cider vinegar on dogs, what should you use it for? 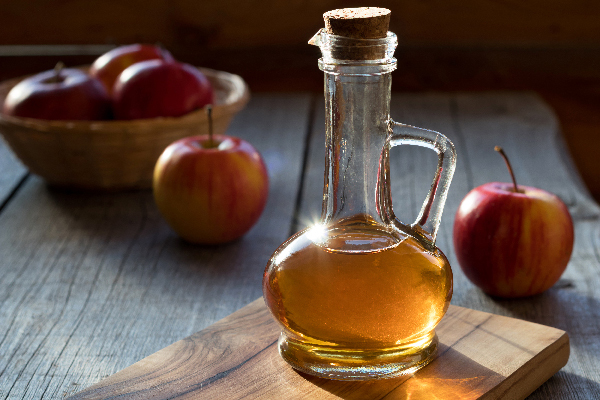 What exactly is apple cider vinegar? Photography © Madeleine_Steinbach| iStock / Getty Images Plus. As the name implies, apple cider vinegar is mostly made from fermented apples with the addition of yeast and sugar. Apple cider vinegar is part of traditional, naturopathic and holistic medical practices. Many people believe they have been successful using it to bring relief to a variety of issues. The key to apple cider vinegar is fermentation. This increases the probiotic qualities and enzymes, which, when consumed, have health benefits. But what about apple cider vinegar for dogs? Why apple cider vinegar for dogs? Apple cider vinegar has a lot of supplemental uses and it’s easy to find — you’ll find it at every grocery store and it’s inexpensive. For dog parents attracted to reducing pesticides and keeping things natural, apple cider vinegar is a commonly used supplement. So, let’s look at the primary uses of apple cider vinegar for dogs, below. Apple cider vinegar is a natural way to treat a dog’s itchy skin. Apply apple cider vinegar to dogs in a 50/50 water/apple cider vinegar solution to soothe itchy skin. You can also put the solution into a spray bottle and spritz it onto your dog regularly as part of your grooming routine, which may improve skin and coat quality. Apple cider vinegar can be used as a natural way to repel fleas, ticks and biting flies. Dog parents can include small amounts of apple cider vinegar diluted with water into a dog’s food or water. You can also bathe your dog with an apple cider vinegar solution or spritz apple cider vinegar on your dog before going on an outdoor adventure. Note: As with any flea/tick repellant, it’s important to regularly inspect your dog for signs of fleas or ticks, especially if they are prevalent in your area. Use apple cider vinegar as a natural ear cleaner as part of your dog’s normal grooming routine. As with other topical applications of apple cider vinegar, mix up 50/50 water/apple cider vinegar. Apply the apple cider vinegar-water mixture to a cotton ball and gently wipe your dog’s ears. If your dog has signs of an ear infection such as redness or discharge, consult your vet. Some studies seem to indicate that giving apple cider vinegar to people can improve digestion because adding acidic acid to drinking water increases good bacteria in the stomach and acidic acid is a primary component of apple cider vinegar. Some dog parents believe that putting small amounts of apple cider vinegar (again equal parts water and apple cider vinegar) into a dog’s food/water in the morning improves his digestion for the day, supports stabilizing weight, and encourages a dog’s ability to absorb nutrients from his food. Don’t get too excited about apple cider vinegar for dogs, though. There isn’t much science behind the claims that apple cider vinegar is a useful treatment for your dog. After seeing all kinds of claims on apple cider vinegar for dogs, I decided to seek out some medical advice before trying anything with my own pups. So, the good news is including apple cider vinegar as part of your dog’s diet isn’t likely to hurt him … but it’s also unclear just how much it will help. As with any natural, alternative or holistic veterinary remedies, it all comes back to personal choice — and checking with your vet to make sure your choices are safe for your dog. And if you choose to use apple cider vinegar on your dogs, never give it undiluted. Always dilute it with water. Tell us: What do you think of apple cider vinegar for dogs? Have you ever used it for anything with your dogs? Thumbnail: Photography © ThamKC | iStock / Getty Images Plus. Sassafras Lowrey is an award-winning author. Her novels have been honored by organizations ranging from the Lambda Literary Foundation to the American Library Association. Sassafras is a Certified Trick Dog Instructor, and assists with dog agility classes. Sassafras lives and writes in Brooklyn with her partner, a senior Chihuahua mix, a rescued Shepherd mix and a Newfoundland puppy, along with two bossy cats and a semi-feral kitten. Learn more at sassafraslowrey.com. The post Let’s Talk Apple Cider Vinegar for Dogs — Can You and Should You Use It on Your Pooch? appeared first on Dogster.